Lucy was purchased in 2009. She was a solid 02 with plenty of history. I bought her as my own car with the intention of further improving on an already solid car. The plan initially was to build an everyday car which would be good on the road but also exciting on the track, as the build progressed the car turned out to be more of a track focused car which can be used on the road. One of the first jobs was to give the car a good look over to check for bad repairs and any other work required to get the chassis up to scratch. There was some fairly serious corrosion to the front off side chassis leg. This was cut away and then re plated and plug welded. I also strengthened the chassis / bodywork by making a plate to secure the inner wings to the bulk head and chassis rails. I also carried out some seam welding to further increase the rigidity. The under bonnet area was then repainted. Next was to modify the suspension, as the car was to be used on the road and track there was some careful consideration on the components. Bilstien sport dampers were selected along with H&R springs, 19mm anti roll bars were fitted front and back. The whole car was also polybushed. A lower camber adjusting plate was added between the strut tube and the steering arm, this increases the negative camber to around -2.0° and also has the effect of reducing bump steer and flattens the angle that the rack end joins the steering arm. The rear subframe bushes are fitted upside down, this effectively moves the rear beam further up inside the car and reduces the –ve camber on the rear wheels. Subframe bush stiffeners have also been used. Originally I used solid mounts but the noise transfer was unbearable! The steering was modified next, the standard steering box has a fairly low ratio and although makes the steering great for parking it’s not so great when you need to apply opposite lock quickly. 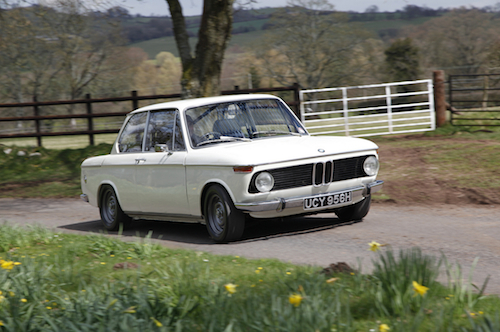 The modification was done using a steering rack from a Talbot Lotus Sunbeam. The steering arms were shortened to around 150mm to increase the lock and correct the geometry. The front subframe was modified to fit the rack and the left hand engine mount was also strengthened as this is a common failure. Then all the components were either powder coated or painted. The brakes were next to be modified, The front struts are standard 02 so the spindles are of the smaller diameter. A pair of e21 front hubs were used with 323i vented discs, Girling 4 pot callipers and EBC greenstuff pads. A set of Goodridge stainless hoses were fitted all round. The Master cylinder was replaced with a larger bore unit from an e9, this has a bore of 22mm as opposed to the 20 mm of the 02 cylinder. This was necessary as the 4pot callipers require more fluid to be moved and using the 02 Master cylinder can result in a mushy pedal. The rear brakes were modified to use e21 drums which have around 20% more surface area than the 02 and the wheel cylinders have a larger bore which matches well with the other upgrades. The whole car was also re lined with KuNiFer brake pipes. The engine was the next consideration. I love the M10 and for me there was no question that this 02 would retain it's original powerplant. It did however need more power so an early high compression tii bottom end was rebuilt with new bearings and rings. All new ancillaries including oil pump were fitted. An e30 318i head was modified to work with the tii pistons, new guides and valves were fitted, the head was not 'flowed' as such as BMW made a very good job of this in the first place but the sharp edges were removed and smoothed and the valve guides were positioned with less protrusion in the air flow. A schrick 292° camshaft & 3 angle valve job finished the head. The engine runs fuel injection via an e30 inlet manifold modified to use an m50 throttle body with a 66mm diameter. The injectors flow up to 330cc/min which should provide enough fuel for around 200bhp. Ignition and fuelling are controlled by a Megasquirt ECU which was supplied by www.extraefi.co.uk.The distributor hole is blanked off with an aluminium plug turned on the lathe and a 36-1 trigger wheel was welded to the crank pulley. spark is generated by a Ford EDIS coilpack which is driven directly by the ECU. An oil cooler has also been fitted as the oil temperatures were rather high when first used on track. A remote catch can was fabricated and colour coded to catch the escaping crank case fumes. 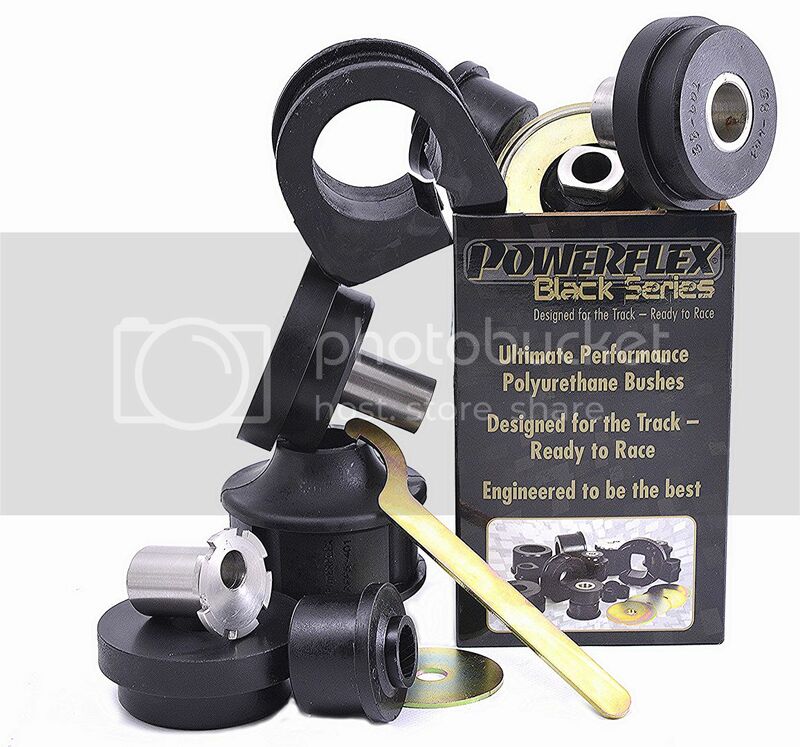 Polyurethane engine mounts have been used on the engine, these do increase the engine noise quite considerably but the trade off is virtually no engine movement and much sharper throttle response. A four branch tubular manifold was used mated to a 2.5inch hand made exhaust. The transmission has been modified to use an e21 5sp overdrive (Getrag 245);box. This is a simple conversion and transforms the driveability of any 02. A lightened 215mm flywheel and H/D clutch are fitted. The prop shaft has been shortened and new centre bearing and coupling used. A 3.91 ratio e21 LSD has been added using hybrid drive shafts and spacers. Wheels are either early tii 5.5j steels with Avon ACB10 tyres for the track or 14inch E30 steels with Toyo Proxes fitted for the road.After testing at the track it turned out that the rear brakes were not up to the job, although there was plenty of braking force provided by the e21 rear drums they did overheat. This is just because they are drum brakes and tend to hold on to the heat more than a disc. I am sure that on a long circuit they would be fine but on a short track like Llandow (www.llandow.com) they overheated. The solution was to change to disk brakes. This was done using modified e21 rear trailing arms, e30 callipers and discs and EBC Greenstuff pads, this is not a straightforward conversion it requires all the spring perches shock mounts and ARB mounts cutting off the 02 trailing arms and welding them onto the e21 arms with a fair amount of precision. I like to run 13 inch wheels on my car and spacers need to be used to clear the e30 callipers, unfortunately this presents a problem with the width of the rear track, the e21 arms are wider than the 02 and with the extra width of the discs and the spaces the rear arches also had to be modified. A bias valve and hydraulic handbrake were also added at this stage as I like to auto solo with the car and a decent handbrake is an advantage.